When she’s not making wine, Lisa is learning to play the ukulele. In the purchasing department at Robert Mondavi Winery. I typed up the purchase orders and cleared corks through customs. I started out as a young foodie with zero wine exposure. I wanted to work at Robert Mondavi because of the Great Chefs Program. It was there when pairing wine with food that I realized the connection. It was definitely a “wow, this changes everything” moment. Oh, the wine was Fume Blanc. Again, Robert Mondavi. A work ethic that values quality above all else and challenges a person to examine if it can be done better at every turn. I adore making things to share with people. There is something special about gathering people together and serving great food and sharing a glass of wine that leaves me satisfied and happy. Sitting down for lunch during harvest. It’s hard to get back up some days! 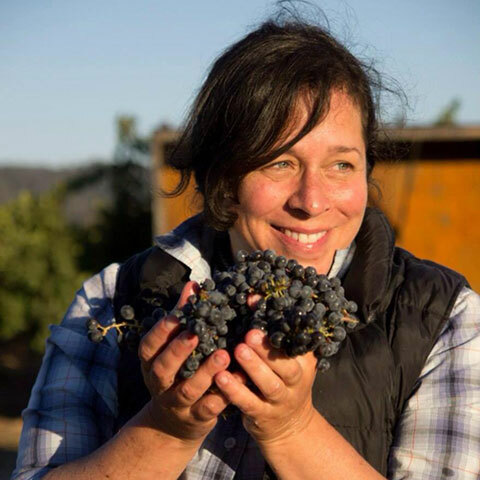 Excellence to me is acknowledging that winemaking begins with people. We have an excellent team of experienced individuals that are not afraid to ask questions and challenge decisions if they think it will influence the quality of our wines. We are making wine from old vines in St. Helena. In particular, our Chardonnay was planted back in the late 1960s and early 1970s. Before there were clones, neighbors gathered together and shared cuttings to help each other. Massal selection is the correct term. I would have a food truck – a deli on wheels – to serve the industrial winemaking areas in south Napa. I am learning how to play the ukulele.